One thing that is often overlooked in home theater setups is power management. Along with all the cables and wires needed to connect components together, an unsightly collection of power extension cords and surge protectors begin to clutter the space behind your TV, home theater receiver, and whatever else you have, creating a mess. A solution to this problem is to connect all your power cords to one central power management system that not only reduces clutter but can also monitor and even out your power consumption. 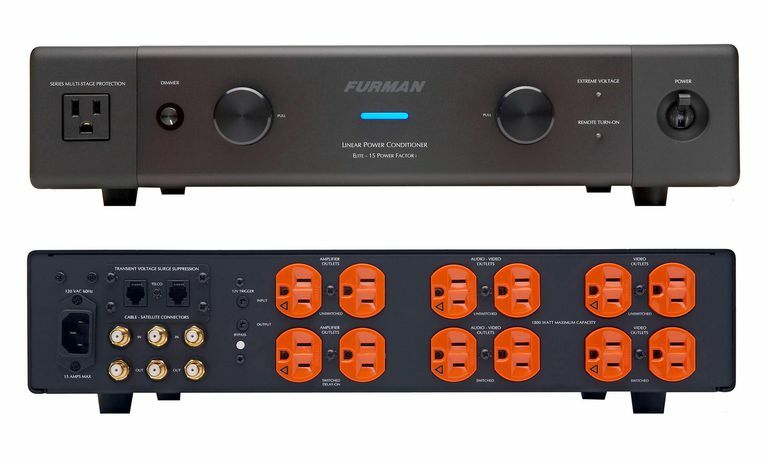 One product that may be suitable is the Furman Elite-15 PFi AC Power Conditioner. 13 AC outlets: 1 Front Panel - Unswitched, 12 Rear - 6 Unswitched, 6 switched. 1 AC Input Receptacle (120 VAC/15 AMPs). 6 RF Cable/Satellite TV Connectors (3-in/3-out). 2 Standard Telephone Line Connectors (1-in/1-out). Power Factor Technology provides over 45 amps of peak charge surplus current for power-starved amplifiers. Wide Bandwidth Linear Filtering Technology for cleaning up audio and video noise or interference. SMP (Series Multi-Stage Protection) Circuit for AC surge suppression. Zero ground contamination circuitry for digital component protection. Transient voltage surge suppression provided for both standard telephone lines, as well as cable or satellite lines. Retractable front-mounted LED lamps to illuminate a cabinet or rack full of equipment. 12 Volt trigger on selected outlets for a custom install on/off control. Hardware provided for optional in-rack mounting. The Elite-15 PFi allows connection of up to 13 device power cords into one, centralized, device. From there, only one power cord is required to connect to a wall outlet. This is very convenient as it eliminates the use of one, or more, power surge protectors or power strips. Another benefit of the Elite-15 PFi is that amplifiers, receivers, and powered subwoofers are electrically isolated from source components, such as a Blu-ray Disc player, or other source devices. This assists in limiting interference that may be generated from one component affecting the power going to another. In addition, the Elite-15 PFi also reduces the noise generated by external appliances that are connected to the same house current. Using the Elite-15 PFi, removal of low-level hum from a subwoofer and background hiss from the rest of the home theater receiver used was evident. However, after looking and listening to several Blu-ray Discs and DVDs I did not notice any change in video or audio quality. In addition to power isolation and protection, the Elite-15 PFi also helps improve signals going through RF cables. Here I did notice an improvement in the noise level from analog cable when routed through the Elite-15 PFi, resulting in a slightly cleaner image on my television. One extra feature of the Elite-15 PFi has nothing to do with power protection, but the inclusion of extendable LED lamps is really a nice touch. The LED lamps are hidden behind what looks like two large dials on the front panel. However, instead of being dials that you rotate, you just pull one or both, and "voila" you have some extra light if you need it. For example, if the Elite-15 PFi is placed as the top component in an equipment rack or cabinet, you can use the provided extendable lights to see the front panel controls on the rest your equipment. This makes it easier to make adjustments in a darkened room. It even helps when you want to open your DVD or Blu-ray Disc package and read liner notes on the back. Unfortunately (or fortunately), no excessive voltage spikes or dips occurred during Furman Elite-15 PFi review period, so personal testimony can't be made to its effectiveness in protecting components from a real-world excessive voltage spike or dip incident. The Elite-15 PFi is very easy to setup and use. Abundant connections for Home Theater Components, Cable/Satellite feeds, and Telephone line. Switched and Unswitched outlets grouped together and clearly labeled. One conveniently front-panel power outlet that makes it easy for connection of temporary devices. Provides protection for extreme voltage spikes and voltage dips. Circuit isolation removes electrical noise and interference from appliances and other devices. The incorporation of extendable LED lamps provides a nice touch for accessing other component controls in a darkened room. No Voltage, Amperage, or Wattage Meter Display. No Battery Backup for emergency shut down. No voltage spikes or dips were observed that could test component protection effectiveness. Pricey, but not out of line with similar products. Some consumers may balk at the price tag that ranges from $599.00 to $749.00. With each new device, you add to your home theater system, there is another power cord to plug in. After the wall outlet options run out, you add a surge protector, then another one, and then you run out of those too. One solution to all this mess is to get a centralized power conditioner that not only provides all the outlets you need, but also provides a practical way to monitor voltage and protect against voltage fluctuations and spikes, and also clears up power line interference. One product suited for the job is the Furman Elite-15 PFi. Disclosure: Review samples were provided by the manufacturer and returned at the conclusion of the review period.